A pair of 5 cm wide hemmed wool tartan ribbons, made to order in Scotland especially for handfasting ceremonies at weddings. May represent wedding couples selection or families' tartans. Presentation Box. Allow 4-5 weeks minimum. 2 SINGLE LENGTHS OR JOINED. 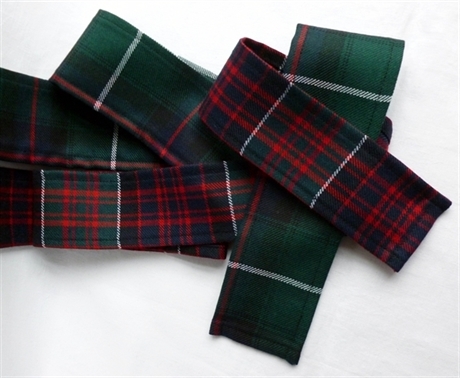 If your tartan is not available in wool you'll need to order Handfasting Ribbon, Tartan Sateen instead. Available in 2 SINGLE LENGTHS OR JOINED..Please note, not all tartans available, contact us for more information.